What's the Difference? Mayan Palace-Grand Mayan-Grand Bliss-Grand Luxxe-Spa Tower? It is Confusing !! So here goes our best shot at explaining the differences. They are all high quality studios and suites with a similar layout. 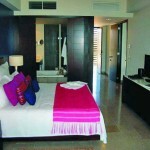 Mayan Palace: This is the standard high quality Vidanta unit. We rent many of these every year and people are often surprised at how truly nice they are. Acapulco has brand new units. Grand Mayan: The Grand Mayan units are significantly larger and have nicer amenities like separate showers, granite counters and Jacuzzi tubs. The biggest advantage are the large balconies for sitting and relaxing with your own private cooling pool. but their light and airy decor is just a bit more contemporary, there is a fridge in the second bedroom, and they are in quieter locations. In Nuevo Vallarta , the Grand Bliss is just a bit farther from the Grand Mayan Pools and there is also a separate exclusive Grand Bliss pool area. 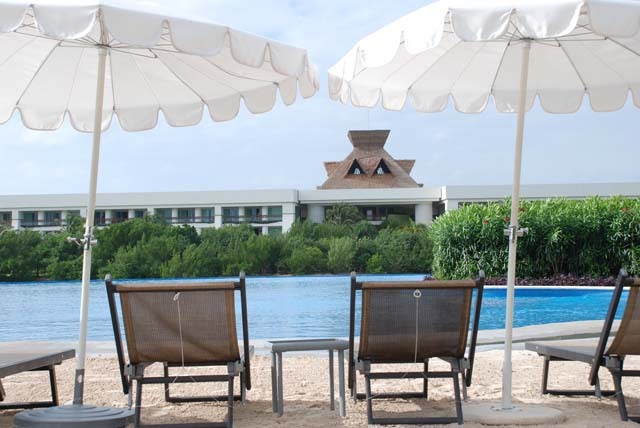 In Riviera Maya, the Grand Bliss is a long walk or a shuttle ride from the pools. and are our top of the line offering (well until the Spa Tower, Loft and Residence become available) The balconies are very large with tables and seating and a luxurious small private cooling pool. There are two types of Luxxe units . You can find more info on these in our Luxxe Villa vs Condo FAQ. Spa Tower: The latest edition are the Grand Luxxe Spa Tower units. They are the first to have a three bedroom option and also have a two bedroom version. They are no larger than the Luxxe but have a separate massage room for private massages, walk in closets, more hardwood floors and what we would call a "softer" decor. The sliders to the deck open up an enormous expanse to the open air on the balconies. We have made a table comparing all the info : Grand Mayan, Grand Bliss, Grand Luxxe, Mayan Palace comparisons We will be updating it soon with Spa Tower and Loft information. First off, I need to say I'm not a golfer. But having spoken to golfers, I've been told that they choose their clubs specifically for their strengths, gender, and even height. It's definitely NOT a one size fits all here. Even though all the courses have pro shops and rentals available, avid golfers probably plan on bringing their own clubs. (Editors comment: for the more casual golfer, rental rates run about $35 to $40 for clubs for 18 holes) I did some searching to find out the various costs of getting a bag, clubs and shoes to your vacation location. At all the Mayan resorts, golf is a BIG draw. For instance at the Grand Mayan Riviera Maya, the El Manglar course is an 18 hole par 54, that is 2923 yards long. On the opposite coast, the Grand Mayan Acapulco offers the Copra course at 18 holes par 72, and 6156 yards. Along the Sea of Cortez, the Mayan Palace Puerto Penasco offers a challenging 7210 yard, 18 hole, par 72 course. At the Grand Luxxe Nuevo Vallarta, the newly redesigned Nayar course offers 6936 yards and 18 holes, par 71. Option 1--US Mail--Not very cost effective when shipping internationally. An average 40 pound bag of clubs using Express Mail International will run about $145. The maximum per-package weight (including the box it's being shipped in) is 44 pounds, so any more than that would require a second box starting at another $30. That's EACH WAY. So therefore round trip costs will be around $300. Insurance would be extra. Option 2--Private Shipping Companies--There are lots of them out there. Just Google "Golf Club Shipping". One company I checked out quoted just over $340 round trip including $500 insurance each way. Another thing to consider is the time it takes to get to your resort. On average, they indicated 6-8 business days. There could be a few problems that might really mess up your golf plans though. There are lots of holidays you might not be aware of and not be considered a "business day" thereby delaying the arrival of your clubs. Another issue could be the time it takes to clear customs. Theoretically quick, but a definite variable you can't control. Option 3--Bring your clubs on the plane to Mexico with you. Golf bag hard cardboard shipping boxes are readily available at an standard size of 15' x 15" x 48" (LxWxH) (78 linear inches) and can be gotten from your local golf shop or online. There can be up to 3 additional fees--second bag, over weight, and over size. The normal baggage maximums are 50 pounds and 62" total size. The fees listed below are as of 1/27/12 and may change at any time. Also all fees are EACH way. Call your airline to be sure to note in the reservation that you'll be bringing clubs--many require advance notice as space is limited. One detail to be mindful of: Often sporting equipment is unloaded last from the plane, so it won't be with your suitcase on the carousel. Be prepared for a wait. Click on the airline link in the examples below to be brought to their sites for extra info. Is there a shuttle to the resort from the airport? Yes and it's free if you rent from owners like us. If you rent from the resort or go as an RCI exchange, there is a $15 charge per person. Either way, everyone pays for transport back to the airport. Everyone uses different terminology, Mayan Resorts call it a Master Room, many internet sites say Studio, most accurate is probably "hotel room"
Mayan Palace studios have two double beds and a small table and chairs. No kitchen. 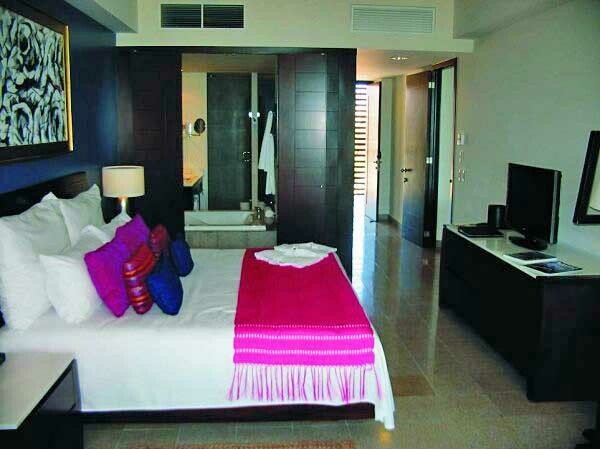 Grand Mayan studios have one king bed and a love seat that pulls out into two short single beds only for kids. there is a balcony. There is no cooling pool on the balcony. You can request a refrigerator based on availability, but chances are very good. Both units are rated for 2 adults and 2 children under 13 years old. Can I get a refrigerator in a studio unit? Which resorts have wireless internet? Are Mayan Resorts Kid Friendly? Absolutely. Mayan resorts are committed to kids. They have kids programs every day for kids 5 and older for free and babysitting is also available at additional cost. Mexicans in general love kids. There are kids activities at all Mayan Resorts as far as we know. You can request a crib at any of the Mayan Resorts at no charge. Just let us know when you make the booking and we will put the request in with the resort. It shouldn't be necessary, but it is probably a good idea to phone the resort a few days before arrival to confirm the crib. What are golf rates for guests? Our Mayan Palace guests have a discounted rate of around $99 and our Grand Mayan guests pay $50 to $70. This is for 18 holes with a cart, and does not include club rental. If you rent from someone else and plan to golf, make sure it is not an RCI exchange, there will be no discount. Upper level units like the Luxxe, Spa Tower and Loft have either free or discounted golf included. Ask for details. Are there VCR's or DVD's in the rooms? Actually... no. But hey, with resorts like these, it would be a crime to sit in the room and watch TV. There are a growing number of english cable channels, but remember what we said about it being a crime. Update: The new Grand Luxxe suites do have DVD player rentals available from the concierge. You can , of course get movies as well. Can I rent for less than a week? In general, rentals are for one week beginning only on Friday, Saturday, or Sunday or Monday. Our rates are so low, it usually costs less to rent a week from us unless you need 3 nights or less. During low season we can sometimes get 1 to 3 extra nights for you. The extra nights are a bit more "per night" but not outrageous. Do We Have to Attend a Sales Presentation? Absolutely, positively NOT !! You are going as the guest of an owner. They will offer you a tour of the resort (read sales presentation) and usually 10 or 15% off your food bill. If that is worth it, feel free. Also, feel free to say no. The sales pitch is really quite enthusiastic. What spa facilities are included? 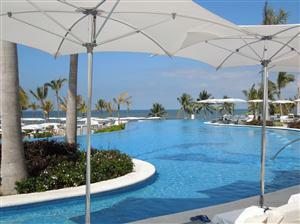 All of the resorts except Mazatlan have excellent spas on site as well as state of the art exercise facilities. Our guests have free access to the spa and workout facilities. You will pay extra for massages, classes and other services. However, many of our Luxxe, Spa Tower, Loft, and Residence rentals come with free massages and some come with 2 for 1 massages. Which unit am I renting? We own the time, not specific units, so you get assigned a unit when you arrive. However, we know the ins and outs of requests, so renting from us is your best chance to get the location you want. We can make requests and some of our contracts are guaranteed a good location. We also send you resort information, with some tips and tricks improving your chance of getting your desired location. The good news is that all the units are of equal, top notch quality. Note that you can't request location if you rent directly from the resort (for twice the price) or if you use or rent an RCI exchange. Are there additional house cleaning fees or taxes? In a word, NO. Many vacation rentals charge extra for maid service and or charge a daily room tax. You are renting from an individual so the only extra charge you will pay is a per week timeshare tax that the resort charges when you check out of only $20-$40. How many people can we have per unit? Two bedroom: 6 adults and 2 kids under 13. One bedroom: 2 adults and 2 kids under 13. Studio : 2 adults and 2 kids under 13. #2 you can Confirm with Mayan Central reservation to confirm that it is booked in your name for the correct date and resort. How do we know you're legitimate? Do Mayan Resorts do all inclusive? No, they don't. Unlike many places with mandatory all inclusive fees, you are free to enjoy the nice restaurants on site, but you can also enjoy the top notch restaurants in town or try out one of the local taco places and save money to boot. Restaurants on site are reasonably priced. All the resorts have a phenomenal breakfast buffet. Prices vary from $10 for small buffet at the Puerto Vallarta Mayan Palace to $19 for the spectacular spread at the Del Lago Restaurant in the Riviera Maya Resort. 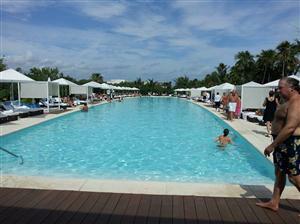 There are casual restaurants around the pool area as well as specialty restaurants of various varieties. We have descriptions of restaurants in the FAQ for specific resorts. The bigger resorts have buffet dinners with a different theme every night and a show with music and dancing. Those are pricier, in the range of $30 to $40 per person. Our rate are low because we connect you with timeshare owners who aren’t using all their weeks. The rental covers the maintenance fee and puts a little cash in their pocket. So our rates end up being usually 1/2 of what you would pay for the same unit if you booked directly with resort. Not only do you get better rates, but you get more perks that only time share owners and their guests can enjoy. That includes free access to the waterpark in Grand Mayan Acapulco, free access to the top of the line exercise facilities at all resorts, and free transportation to the resort in Riviera Maya, Puerto Vallarta, Nuevo Vallarta and Los Cabos and Mazatlan. The catch is the extra steps of having us check availability and pay before you go. We have Instantly Available Units that we have already paid for and pre-reserved. But, if those don't work you will need to fill out an Inquiry Form We try to get back to you quickly. Certainly! The water is totally drinkable in all the Mayan Resorts. In addition all the tourist area restaurants use filtered water. DO NOT LET WATER FEARS prevent you from enjoying Mexico. However when you travel to areas like the Mayan ruins or up into the mountains in Puereto Vallarta you should buy bottles of water on site. Make sure it is still sealed. Otherwise COKE (without ice) or beer are safe to drink. We have written a more extensive blog post on water in Mexico that may be helpful. Is there free transportation to the resort? Guests that rent with us, get free transportation from the airport to the resorts in Puerto Vallarta, Nuevo Vallarta, Riviera Maya, and Los Cabos. You will have to pay for transport back to the airport. We will send info how to arrange transport when we complete your booking. Unfortunately, the Mayan Palace Acapulco and Grand Mayan Acapulco do not provide free transportation to the resort. We are not sure why this resort is the exception. It may be because the resort is only a 4 hour drive from Mexico City and many people choose to drive. In any case, it is best to catch a taxi for the short 10 minute ride to the resort. Make sure you specify Acapulco Grand Mayan or Acapulco Mayan Palace so they drop you at the right reception area. The taxi rate isn't bad, maybe $20 or less. Absolutely !! All the suites are air conditioned ! These are all world class resorts in Mexico. How old do you have to be to check-in? In Mexico they are not as fussy about age. Certainly 18 years old is fine. Are there pull out couches in all of the studio units? 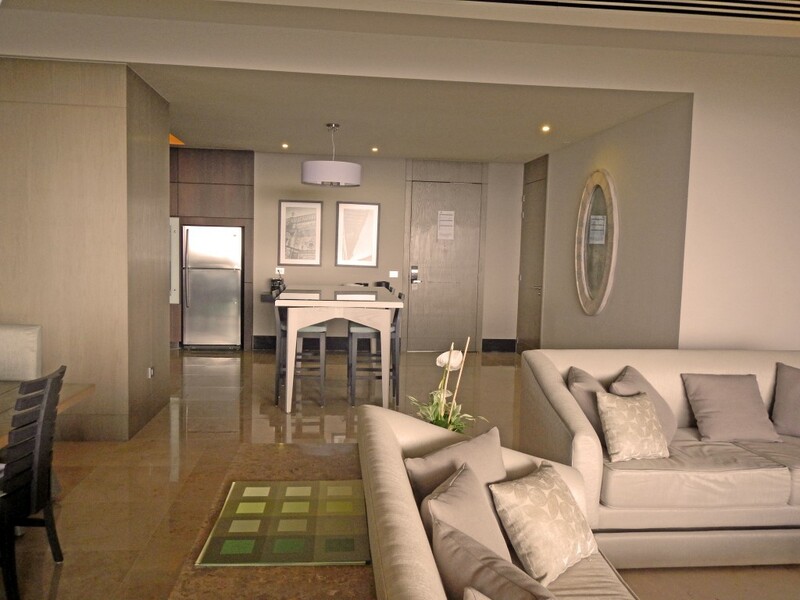 There are pull out couches that are too short for adults in all Grand mayan and Grand Luxxe condo studios. The same is true for Mayan palace studios with the exception of the Mayan Palace Playa in Acapulco which has only the king bed. The Grand Luxxe Villa studio (Junior Villa) has 2 adult single beds in a separate living space. Is there a room tax? Is there a room tax when we rent from you? Yes there is a small timeshare tax charged by the resort. It depends on the cost of the unit and varies from $20 to $75 for the entire week. Most units are around $30 to $40. Mexico is a fairly conservative country. Keep your suit on. Is there an iron in the units? Traveling sometimes gives you the "slept in" look. Can We Make Wedding Plans? Sure. there are wedding planners at the resort and off the resort. we can get accommodations for your whole family and all your friends. Just contact us early. 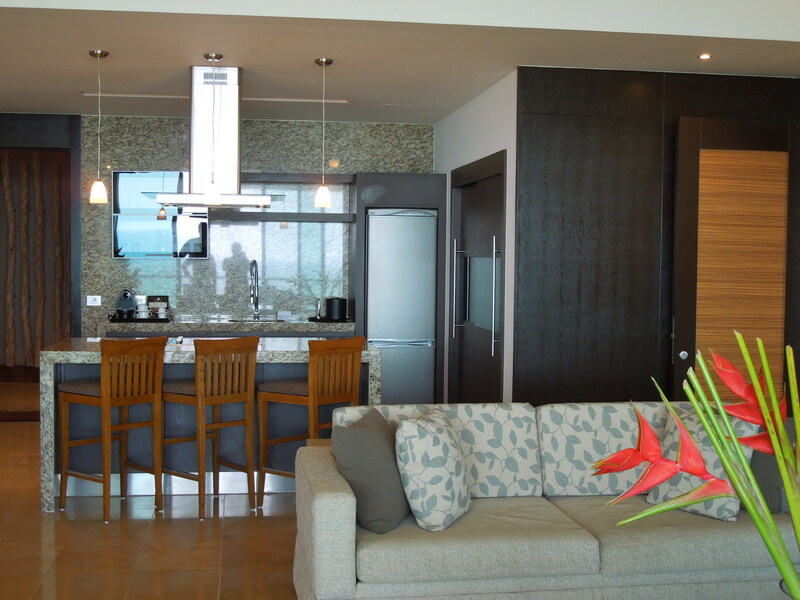 There is a coffee maker in all suites at all luxury levels from Mayan Palace to 4 Bedroom Residence. In fact there are are blenders, toasters, pots and pans and a microwave as well. There is a coffee maker in Luxxe Villa studios and Loft studios. There is no coffee maker in Mayan Palace, Grand mayan or Luxxe condo studios. We are not sure about Grand Bliss studios. Please leave a comment if you know that answer. Add A New FAQ Question ! Wait !! things have changed and Alamo has started doing add ons when you get to the rental location. We now use Budget and they do a very good job of not up charging. if you are American, go to the US based budget website to book it. The phrase “speed bumps” is really inadequate to describe the No. 1 driving hazard in Mexico. The little ones called topes (TOH-pays) are ubiquitous. Appearing randomly for no apparent reason, they are sometimes heralded by signs and sometimes not. These are very unpleasant if you don’t see them and neglect to slow down. 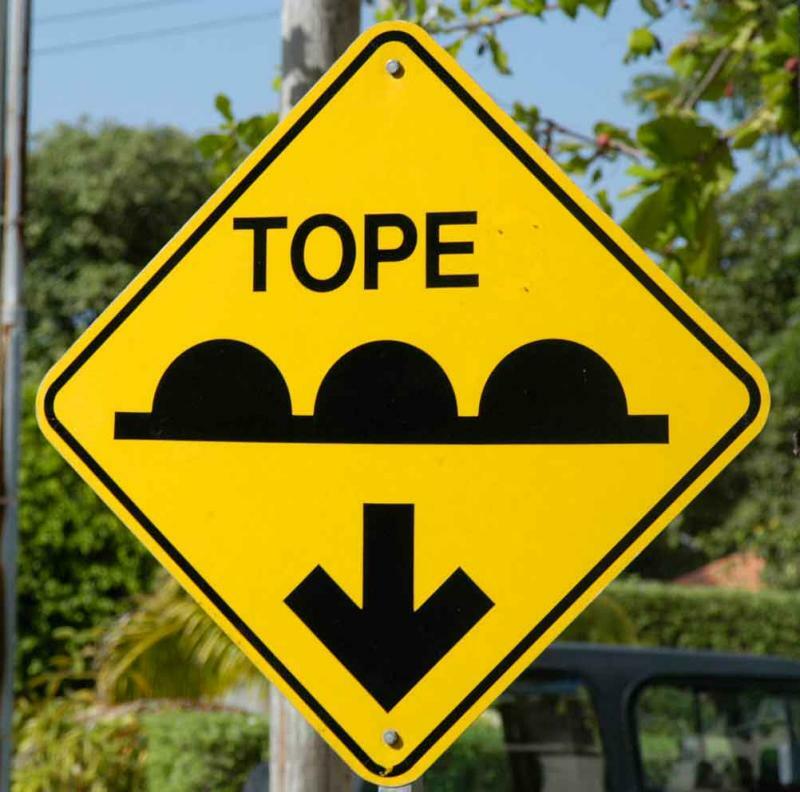 However, topes are nothing compared to the huge speed bumps occasionally found on highways and frequently in towns, which have a 45-degree ramp on each side and a flat top. If you don’t see these and don’t slow down, you will be airborne. We have seen it happen. This is the primary difference between driving in Mexico and driving in the U.S. A left turn signal may mean, “I am turning left,” but it is more likely to mean, “It is clear, you can pass me now.” So do not stop in the driving lane and turn your left turn signal on!! The protocol for left turns is to pull over to the right shoulder and wait for traffic to clear before turning left. Seriously!! That’s what you do! Also, in bigger towns where there is a central through lane with a separator and an outside lane, you are supposed to cut across the divider when there is an opening in it to the right outside lane and wait for a green arrow to cross left in front of the main lane while it is stopped. Seems a little crazy to us, but that is how it works. Some places, there are what we would call conventional left-turn lanes and you can do what comes naturally. You will see many warnings against driving at night. Things are not marked well, pedestrians and bicyclists are difficult to see, and speed bumps appear out of nowhere. We have driven at night on multiple occasions without incident. We would suggest not driving alone at night. Also, acknowledge that the later you drive, the more likely you are to encounter drunk drivers, which is reportedly an even bigger problem in Mexico than in the rest of North America. Liability insurance is mandatory in Mexico and is included with rentals by law. Sometimes they are a bit stingy with dollar coverage and you may want supplemental liability insurance. You can get details on insurance and using your credit card car rental insurance in our article on car rental insurance in Mexico. Police in Mexico do not have as much of a public service mindset as in the U.S. or Canada. When driving in any foreign country, it is much better to just not break the laws. Drive the speed limit, everyone wear their seat belts and don’t turn on red. There are stories about police stopping tourists and threatening tickets and fines while hoping for a bribe. We have only had that happen once in 10 years, and we just said, “Fine, let’s go down to the station,” and they eventually gave up. Whatever you do, be polite and respectful. Do not give them your car rental paperwork. You will also read stories about being cheated at the gasoline pump. We have never had that happen (that we know of). It is best to get out of the car and keep an eye on the pump. You will need to have cash; gas stations are government-run and do not take credit cards. Just make sure the pump is reset to zero before your fill-up starts. If you follow these simple tips, you will be able to safely drive in Mexico and enjoy exploring all the country has to offer! Obviously, there's Google Maps. Once you zoom in on the area you're staying, you can add markers for all the places you want to visit by making your own map. Click on the "my places" tab and start adding place markers for all your must-do's on vacation. 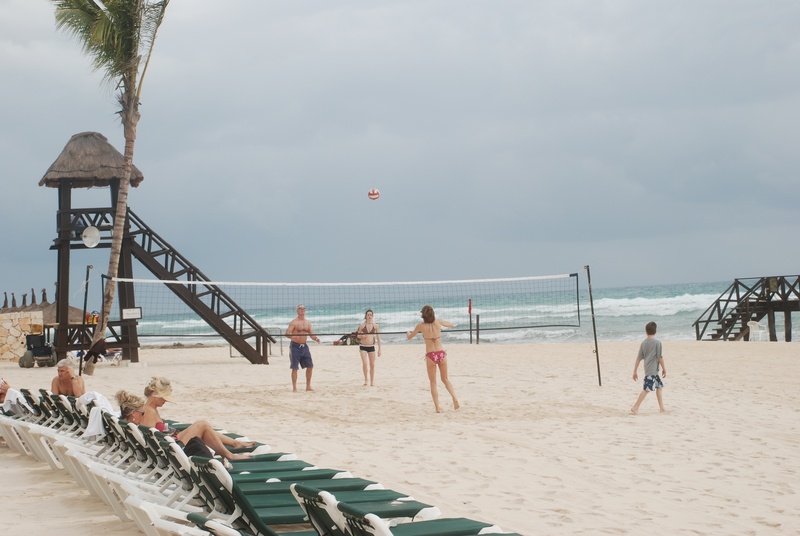 We think the Grand Mayan Riviera Maya is a great home base. Here's a tutorial on how to make your own map. For our vacations in Mexico, specifically the Riviera Maya, I always consult Map Chick's maps. Their maps are actually VERY detailed guides to towns, beaches, hotels, restaurants, and places to visit. TONS of info for drivers as well including car rental locations and highway maps. Though sometimes restaurants might change before the updates come out, the guide is quite accurate for everything else. Be sure to click on the "downloads" page for a free fish identification chart. Last but not least is Loco Gringo's aerial maps. SO much fun to "fly" along the coastline. As you probably know by now, since early 2007, passports have been required for entry into Mexico for US citizens. Also, if you are taking any children that are not yours, you will need a letter of permission from their parents as well as their passport. The U.S. government is not the fastest paper processors in the world, so get your application in early. That is a difficult question. We always do, but we love to explore and have the freedom to come and go as we please. Riviera Maya now has an inexpensive shuttle to Playa del Carmen, but the other resorts will require a cab or bus to get into town. If you want to primarily relax on the resort, skip the car rental and take an orgnized tour or two and take a cab into town when you want to go. That is a great question. It is always a little bit of a challenge. We own time, not a specific unit. The specific unit is assigned at check in. However, we always do everything we can to get ocean view. We put the request in and we try to use contracts that have more priority. If you are getting a discounted unit in the summer, we always make the request, but the chances are not quite as good. When you check in ask immediately if you have been assigned an ocean view room. If not , polite persistence is your best strategy. You could even offer to wait and get a drink by the pool , while a better location comes available. If you are staying in the Grand Mayan buildings in Nuevo Vallarta and don’t get an ocean view despite your best persuasive efforts when you check in , you should request to be placed in Buildings 4, 5 or 6. The view on the back side of those buildings is still very nice. Another alternative in both the Grand Mayan and Grand Bliss units is to request to be moved to an ocean view the next day. 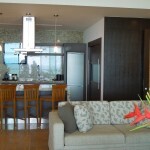 You will have to decide if it is worth the hassle of moving and the uncertainty that an ocean view will be available. We do everything we can do to get you ocean view, but we can’t ever guarantee it. In fact , if anyone says they can guarantee it, they are confused or …. Less than honest. What are all these different types of Luxxe suites? This is a detailed description of the different types of Luxxe units. If want a general comparison of all the different unit types (Grand Bliss, Grand Mayan . Grand Luxxe) see our Mayan Unit Type comparison . If you want a detailed description of the different Grand Luxxe units , keep reading. The first two Luxxe units were the Grand Luxxe Villa and the Grand Luxxe Condo. The Grand Luxxe villa two bedroom suite, is on the corner of the building, has a separate (additional) living area with fridge and microwave in the second bedroom and an additional balcony that comes out on the end of the building. The Grand Luxxe condo (also , unfortunately called a suite, apparently just to keep us confused) are the side units of each building. 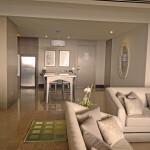 The one bedroom suite is almost identical to the Villa. The second bedroom (or the studio if you lock it off) is smaller and has no separate living area. Currently in Nuevo Vallarta, the Villa and Condo units are in buildings 1, 2 and 3. Both of the buildings in Riviera Maya Grand Luxxe are Villa and Condo units. The Luxxe building closest to the ocean in Nuevo Vallarta is the Presidential Punta. Each of these units are 3 bedrooms. They are a two bedroom unit and a separate one bedroom suite with a common vestibule area. We do have owners with these units to rent, but you have to reserve a year in advance to have a decent chance of getting what you want. These units are the top of the top and are decorated in the most luxurious of styles. Our Presidential contracts all come with access to the exclusive reserved Platinum area of the pools. Building number 4 in Nuevo Vallarta will have 3 bedroom units all connected. As of this update (August 2012), these units are not finished. All of these units are the highest level offered by Vidanta. This FAQ should help you choose the one that most closely fits your needs. 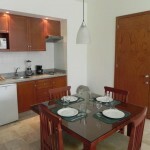 You can find photos and accommodation details by going to the MayanRental main site and exploring the menu at the top. What are the Grand Luxxe Pools and Who Has Access? 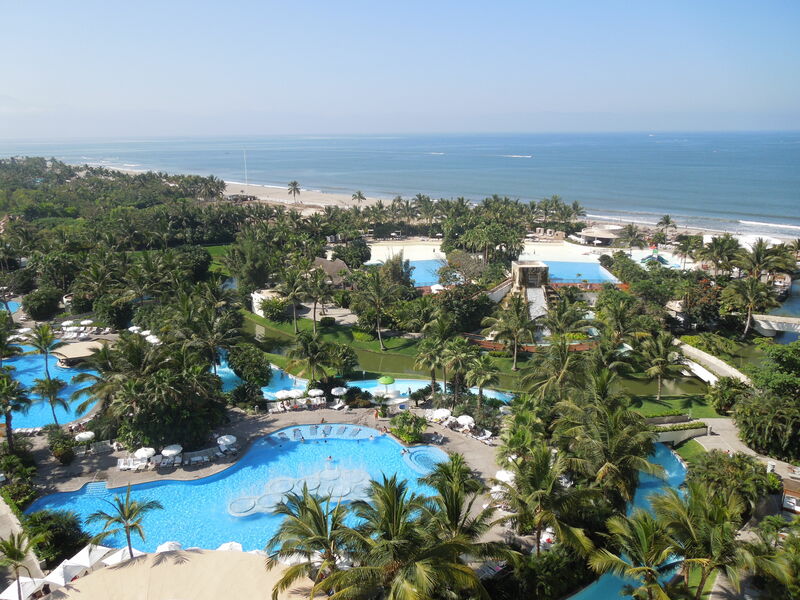 The Grand Luxxe buildings are located at the south end of the Nuevo Vallarta Vidanta resort. The pool areas surrounding the Luxxe buildings are quieter and have some special services like free popsicles and sunglass cleanings. Be careful though, the ice cream bars they sell are not free. 🙂 There is a nice Jacuzzi area and a nice view of the city of Puerto Vallarta, but no lazy river, slides or kids area. Last time we were there we saw a very cool 4 foot iguana. (see our Larry and the Iguana video). The Luxxe pool area is open to guests at the Grand Luxxe. 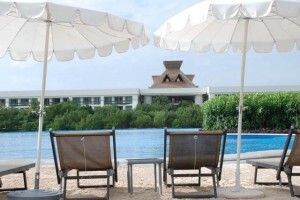 If you rent from us (MayanRental), we can use a Luxxe contract to book your Grand Bliss or your Grand Mayan suite. Then you will have access to all the pool areas throughout the resort and also get a few extra perks like free golf or free massages and free internet. Of course, booking with these contracts will cost a bit more. One minor exception, is the areas reserved at the Luxxe pools for Platinum owners. No worries, though, if it is important to you we have contracts with Platinum owners as well, but it might cost you a bit more yet. 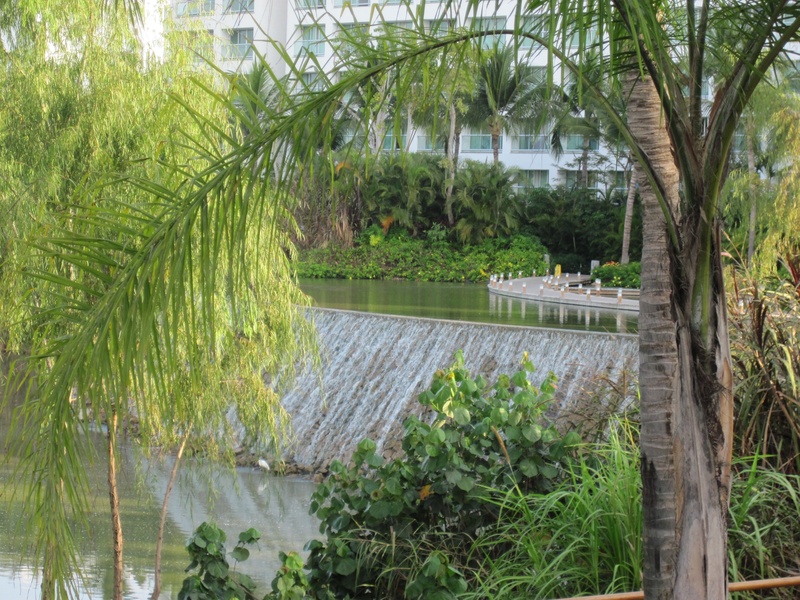 If you are staying at the Grand Mayan or Grand Bliss and want to visit the Grand Luxxe pools , you can either hop one of the shuttles or walk through the landscaped grounds near the Bay of Banderas. The walk is about 15minutes. Oh, I almost forgot. If we book your Grand Mayan or Grand Bliss week with a Grand luxxe contract, you also get access to the Grand Luxxe exercise facilities. Honestly, the Grand Mayan exercise area is pretty fabulous, but the Grand Luxxe does take it a couple notches higher. Is the Puerto Vallarta and the Nuevo Vallarta Resort the same? Update: Now there are also Spa Tower Two or Three Bedroom suites , Loft Two or Three Bedroom suites and the SPECTACULAR Four Bedroom Residence Units. These are not in the resort type comparison. What happened to the Nuevo Vallarta Mayan Palace? It... well... shrunk. The two buildings near the beach have been torn down. There is still a building on top of the hill looking over the ocean. Half of it is now the La Plaza market with a beautiful variety of meats, vegetables and baked goods. Also a creperie , soft serve frozen yogurt and the new French restaurant Azul on an uppper floor. Most people do prefer the Grand Mayan in Nuevo Vallarta because Mayan Palace guests don't have access to the big waterpark area with the lazy river and other fun stuff. . However, some of our guests prefer the quieter atmosphere (and lower price) of the Mayan Palace. The Mayan Palace pools are also very quiet and are located down by the beach. Because there are so few units left, you need to book these VERY early. Yes, wireless internet is available in the Grand Mayan, Grand Bliss, Grand Luxxe and Spa Tower buildings. Basic internet is free, but recently they added an upgrade option for more an additional fee. How is the Beach at Nuevo Vallarta? 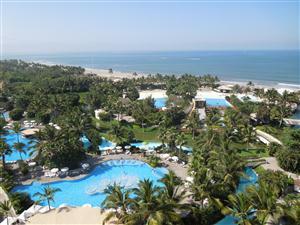 The Nuevo Vallarta Mayan resort has a nice beach over a ½ mile long. The sand on the Pacific side is of the coarse brown variety, not the powdery white stuff of the Caribbean. However the swimming is great, with moderate sized waves that are perfect for playing and body surfing. If the wind comes up the waves are a total blast. The beach is a great place for a morning walk , beach volleyball game , or to launch a your parasailing experience. If you want some real surfing, you can head up the coast just a few miles to Sayulita. Who has access to the Grand Mayan water park area? This question used to be a big deal because guests in the Mayan Palace do not have access to the spectacular Grand Mayan water park (<-- click to see video) . However, there are very few Mayan Palace units left and most of our guests stay in the Grand Mayan , Grand Bliss or Grand Luxxe. 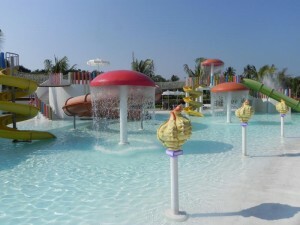 The Grand Mayan Nuevo Vallarta water park is one of the highlights of all the Mayan resorts. The Grand Bliss Nuevo Vallarta building right next door shares this area, which includes a lazy river, two wave pools and a giant pyramid water slide. Our guests at the Grand Luxxe Nuevo Vallarta have a bit farther to walk or shuttle, but they have access to all facilities on the entire resort. However, if you have children who want to spend the majority of their time in the waterpark, the Luxxe may not be your best choice. If you have young children (under 8 or so), there is a new waterpark area for the younger crowd being built next to Luxxe Building 4. It is not open yet, but should be opening around the end of 2014 (our best guess). Unfortunately, Mayan Palace and Sea Garden guests do not have access to the water park. They do have access to all the restaurants and bars. Is there a washer and dryer in the 2 bedroom unit at the Luxxe Villa Nuevo Vallarta? The Luxxe units do not have a washer and dryer in the unit. there is one in every building. You need to move up to the Loft two or three bedroom units to get a washer / dryer in the unit. The four bedroom residence of course, also has a washer and dryer. This is true in the Nuevo Vallarta Luxxe as well as the Riviera Maya Luxxe. Is there a difference between the bliss and the grand bliss? Yes, The Bliss is only in Riviera Maya and is half way between the Mayan Palace and the Grand Mayan. It doesn't have the Grand Mayan style balcony. the Grand Bliss is another notch bigger and another notch nicer than the Grand Mayan and is currently available in Nuevo Vallarta and Riviera Maya. when you stay at the mayan palace can you visit the other mayan resorts and is there a shuttle? Mayan Palace guests do not have access to other Luxury level pools. Of course there is access to all restaurants. For dining can shorts and sandals be worn into all restaurants? Which restaurants require pants and closed toe shoes? Not 100% sure on all options. Certainly Tramonto requires close toed shoes. Gong and Azur are very classy. Most restaurants are pretty forgiving, But hey , it won't kill you to up your game a bit. I am not going to mince words. No. You cannot get ocean view. Because of the hurricanes on the gulf of Mexico side, the resort is built back a bit and perpendicular to the beach. The Mayan Palace units have jungle view and the Grand Mayan units in buildings 1 to 7 can have a view of the beautiful man made lake area. We always request lake view and chances are pretty good. I Heard You Can Get Ocean View in the Grand Luxxe building. units do have a special reserved area on the luxxe beach/pool area where you can get food delivered from the new Gourmet Burger Custom Made restaurant. Any other bright ideas for ocean view lovers? What's the Deal with the Beach-Riviera Maya? The beach for the Grand Luxxe, Grand Bliss, Grand Mayan and Mayan Palace (and the new Spa Tower) in the Riviera Maya location is the typical powdery white sand beach of the Caribbean. In the water, it is really too much rock/coral for swimming. There is a small trail through the coral for those wanting to try their hand as snorkelling. If swimming in the ocean is part of your vacation experience, you have a couple of options. You can walk about 10 minutes to the north to where the orange buoys mark a swimming area at the next resort. The beach is open to the public by law. An alternative is to drive or take a cab the 10 minutes to Puerto Morelos. This small fishing village has a beautiful sandy beach with excellent swimming. You can hire one of the fisherman to take you our snorkeling if you want. There is a nice Mexican restaurant right on the beach. It is on the main square as you come into town. You really can't miss it. Internet access in the Riviera Maya resort? Yes. The riviera maya resort has been updated to provide wifi access in all rooms. Brand New Acapulco Mayan Palace Is Open? is open. Not only are the suites built in the new Mayan Palace Regency style, but there is a beautiful water park complete with lazy river and a kids area as well. Two different guests have sent us pictures, so we already have a Mayan Palace Acapulco photo album. The Mayan Palace buildings are located near the entrance to the Acapulco Mayan Resort along side the golf course. We have access to just a few elite weeks that can be booked during Holy week, Easter week, Christmas week and New years, so book early. Shuttles run full time to the Grand Mayan / Beach area. AND !!!! As of 2015 , a new Mayan Palace tower on the beach was finished. It has it's own pool area. At least during the busy season, guests of either Mayan Palace, do not have access to the Grand Mayan pools. How's the beach at the Acapulco Mayan Resort? The Acapulco Grand Mayan sits right on the golden half moon crescent of Acapulco bay. An additional advantage is being 20 minutes away from the city pollution of Acapulco. So, ocean swimming is great at the Grand Mayan Acapulco and Mayan Palace Acapulco. If you hang out on the beach very long, some enterprising local will show up with horses for beach riding or someone with a boat and a parasail for a scenic ride over the bay. 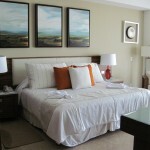 The brand New Mayan Palace Acapulco is just a short shuttle ride to the beach from it's golf course location. As of 2015 , there is also a Mayan Palace Tower on the beach called Mayan Palace Playa. Is Grand Mayan Los Cabos Smaller than Other Mayan Resorts? If you have stayed at the Acapulco, Riviera Maya or Nuevo Vallarta Mayan resorts, you will be surprised by the Cabo resort. It is a small hotel with well under 200 units, all of which face the ocean and the pools. There is one main restaurant in addition to a poolside restaurant . But in San Jose del Cabo there are a good number and variety of restaurants within walking or short cab distance. And the quality is excellent. All of the units here are Grand Mayan. If you have been to Puerto Penasco or to the Mayan Palace in the Puerto Vallarta Marina, the size is similar to those places, but they are both Mayan Palace and Cabo is all Grand Mayan. So the smaller resort size has advantages and disadvantages. It is relaxed and quiet. It has a less formal feel. However, it doesn’t have eight or nine restaurants on site and there is only a 9 hole golf course that is not right onsite. So if you want a large resort , with a lively water park, lots of restaurants on site then you would prefer the Nuevo Vallarta or Riviera Maya location. If you want a quieter location and smaller area with fewer on site restaurants then Los Cabos or maybe Mayan Palace Puerto Penasco. Can You Swim in the Ocean at Grand Mayan Los Cabos? Generally speaking… no. The problem is that the location on the tip of the Baja peninsula where the Pacific Ocean and the Sea of Cortes tides collide creates wicked currents that make swimming truly dangerous much of the time. Of course, like all of the Mayan resorts, the Grand Mayan has beautiful pools including an infinity pool looking out to the ocean. And there are a few time periods where swimming is safe. But for the most part , if you have your heart set on ocean swimming, you will need head down the road toward Cabo San Lucas. On the corridor between San Jose del Cabo where the Grand Mayan is and Cabo San Lucas there are three protected bays where swimming is safe and fun. You can find detailed information on how to get to them on our post: Swimming Beaches in Cabo. Our beaches post also mentions the Cerritos beach which has a lot of current, but is fun to wade and enjoy the water. That one is not in the Los Cabos corridor, it is several miles north of Cabo San Lucas. Does the Los Cabos Grand Mayan resort offer programs for children or babysitting services? I have a 5 and 3yr old and wonder what is offered for them at the resort. Yes, there are kids programs for the 5 year old (and older) and you can hire a babysitter for the 3 year old. There are great kids programs at all Vidanta locations. Is there wireless internet available-Cabo? Yes there is wireless available in the room. Standard WiFi is free. Can you drive to Mazatlan from Northern Mexico? Located on the Durango–Mazatlán highway, Mexico 40D, the bridge spans 3,688 ft (well over half mile) with a central cable-stayed span of 1,710 feet. 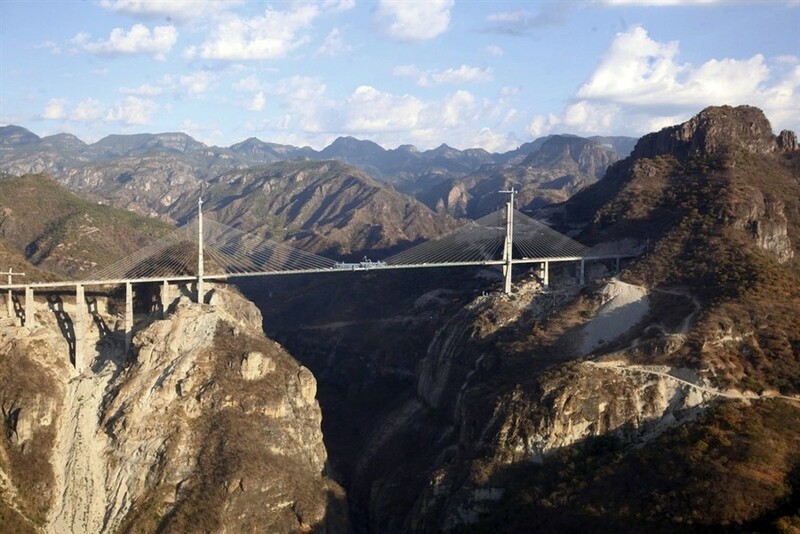 The height above the valley floor of 1322 feet makes it the the highest cable stayed bridge in the world. There are only two bridges in the world higher and none in the Americas. Construction of the bridge began in 2008, but it didn't open to traffic until late in 2013. The bridge has reduced the driving time form a previous 6 hours to only 2 and 1/2 hours. Mexico is however, very large and the driving time from Monterrey to Durango is still around 9 hours. So this bridge is good news to those using the port of Mazatlan, and to those living in the Durango area, but the distances across Mexico in areas with travel warnings, probably make it not very useful to our American guests. As you might expect for such a huge project. the cost has exceeded the orginal bid of US$118 million by a large margin. , Around 2,000 vehicles are expected to use the bridge daily. During the ceremony, President Calderón hailed the bridge as a way to "unite the people of northern Mexico as never before. What type of units are at the Mazatlan Sea Garden and Mayan Palace? Mazatlan Sea Garden is an older style high rise on a beautiful beach. The units are all "two bedroom" units. They are really more 1 1/2 bedroom with one bathroom. The second bedroom is not private and has a pull out couch. The units are rated for 7 people (maximum 5 adults). We have great rates and often specials for this resort. The Mayan Palace in Mazatlan is the newer larger style Mayan Palace . The two bedroom is two bath and has a nice sized living room. 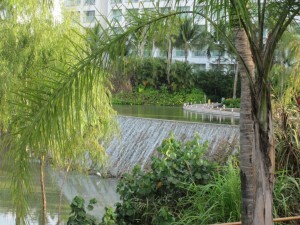 It is on the same resort grounds with the Sea Garden. How do we drive from Phoenix? We have whole web page dedicated to answer that question. Just click to get Driving Directions to Puerto Penasco Mayan Palace and Grand Mayan.